Operating for 24 years, EcoTraining is the pioneer and leader in safari guide and wildlife training in Africa. EcoTraining is widely recognised by the safari industry for its credibility and standard of excellence in nature guide training. This comprehensive and unique one-year course has been designed to supply the safari industry with high-caliber FGASA endorsed and CATHSSETA qualified professional field guides. Students live and learn at four different unfenced wilderness camps giving them exposure to diverse ecological and geographical terrains, wildlife species, climates and more. This FGASA endorsed, CATHSSETA accredited course is the entry level qualification into field guiding which comprises of vehicle based guiding in dangerous games areas. Once qualified, the field guide is able to identify and interpret natural elements of the natural environment and conduct game drives for guests in a limited geographical area. This FGASA endorsed course aims to develop practical guiding skills and to expand on the FGASA Field Guide syllabus. Majority of training time is spent exploring the wilderness on foot. This course gives participants the grounding to conduct nature walks in big game country and boasts a strong emphasis on guiding safety and dangerous game encounters. The aim of this course is to develop and practice skills and gain knowledge to attain the FGASA Trails Guide Back-up qualification. This course aims to supply the Kenya safari industry with high-caliber KPSGA Bronze qualified professional field guides. Participants take part in a variety of learning activities while driving and walking in some of the most breathtaking wilderness areas in Kenya. The syllabus covers a broad spectrum of subjects including 4×4 vehicle skills, radio procedure, ecology and geology to mention a few. This course is designed to provide participants with an ecological learning experience in the wilderness. The EcoQuest course, suitable for nature lovers, emphasises two components – learning about the fascinating elements of nature and how each are carefully interconnected to one another in a specific region and at the same time, experiencing aspects of typical safari guide training. A vast amount of information can be gathered about mammals, birds and reptiles without ever having seen them. Every animal leaves some indication of its presence or passing whereby it can be recognised. Participants are taught how to ‘reconstruct’ the scene and understand what could have, would have, and should have happened. Through the ancient art of tracking participants will connect with iconic places and creatures of Africa on foot. The first of its kind in the safari industry, this course was developed in 1993 for the purpose of offering participants a glimpse into the life and work of a Safari Guide. This course teaches participants the practical and theoretical scientific knowledge of the natural environment. This is a great course for those who are still deciding if a career as a safari guide is what they want to pursue. This course teaches participants about the equipment needed to become a versatile wilderness photographer. Participants also learn about the various elements that combine to make good wilderness photographic compositions. Participants spend mornings and afternoons in the bush looking for photographic opportunities followed by a lecture each day and constructive criticism of any digital photos taken during activities. This course enables birding enthusiasts to identify a great variety of species of birds by sight and sound and to also learn about their biology and ecology. Participants don’t have to be a ‘twitcher’ to attend. The course caters for those who wish to learn about the basics of bird identification or improve their existing identification skills. This purist wilderness experience is about traversing across some of the finest and most remote wilderness regions of southern Africa on foot. The course may challenge some personal boundaries as participants sleep in the open wilderness under the stars, track and stalk game, and travel light with minimal supplies. Lessons include wilderness appreciation and the MIA (Minimal Impact Approach), situational awareness, setting up an eco-friendly camps and water purification, and ‘leaving no trace’ are but a few of the advanced skills you will learn. Whilst absorbing all there is to know about nature on game drives and nature walks, participants also learn about the three-way relationship that exist between the local communities, wildlife and conservation efforts. It is an immersive educational safari for those wanting to visit Kenya specifically. This course fits perfectly with wildebeest migration and other Kenya travel plans. Participants enjoy daily bush activities on the Mara plains teeming with wildlife; learn to track and trail game; learn about the fauna and flora, study the Kenya night skies and get to know how the ecosystem works. The camp consists of 10 walk-in Meru tents, with twin beds (students share tents) and supplied bedding (a duvet and one pillow); although you might want to bring an extra blanket for the winter months and an additional pillow should you require. There are also shared ablution facilities and a central communal area. We have mosquito nets in camp. There are viewing decks in the central area of the camp, which many students choose to make their “bedroom” for part of or for the duration of the course. The camp itself is unfenced. In terms of age restriction we will accept participants from 12 years of age (accompanied by an adult), and 16 years of age unaccompanied. Please understand that our unfenced bush camps are all in dangerous game areas, and it is with the participant’s safety in mind that this restriction is in place. There is no cut-off age to our courses, provided participants are of a reasonable level of fitness. In order to attempt the FGASA qualifications, participants are required to be 18 years or older and be in possession of a valid driver’s licence. The age ranges of students tend to be from 18-65 … We have a wide variety of people, from a wide variety of countries. 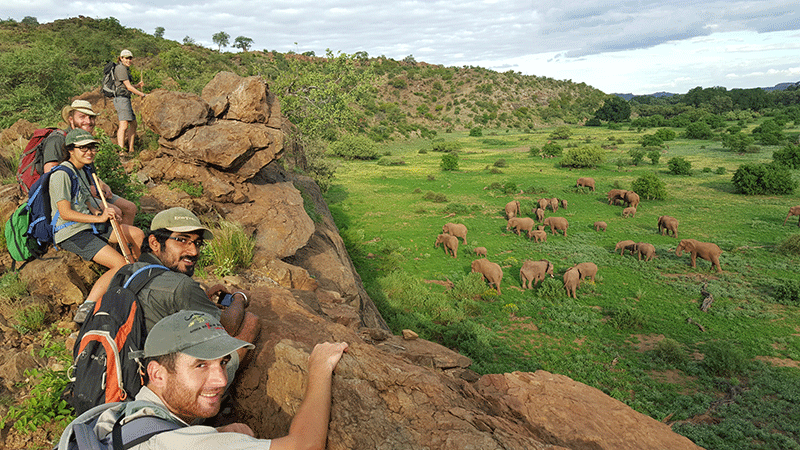 Be assured that you will meet and study alongside interesting people who are passionate and enthusiastic about conservation, and more specifically about the bush. We only have 20 beds available at each camp and these are reserved for paying participants only. We also accommodate our past students with volunteering positions in camp. We are fully allocated in terms of staff and volunteers at the camp, and will therefore not be able to accommodate an accompanying non-paying participant on course. We book on a first come, first served basis and therefore it is tricky to advise as to when you should book for your course. We can’t guarantee availability at any time, but can suggest that the sooner you book the stronger the likelihood will be that we can offer you a space on a course. Some courses are more popular than others, and certain times of the year are also busier. Our advice is that as soon as you are ready to commit, please make your booking. We would typically require the registration forms completed and returned within seven days of making your booking, and payment of the deposit within two weeks from then. Please arrange flights into Johannesburg (OR Tambo International Airport). From there you are welcome to make use of our own Bush Bus transfer service, which runs between Johannesburg and our four camps in southern Africa. Alternatively, you can arrange a connecting flight to smaller airports nearer to our camps (Hoedspruit Airport for Karongwe and Selati Camp/Polokwane Airport for Mashatu or Makuleke Camp), with private transfers to the camp meeting point (arrival). Please bear in mind, though, that these connecting flights and private transfers are quite pricey. We feel the Bush Bus transfer is a far more affordable and practical option, in terms of getting to the camps. Our logistics department will be able to best advise you on your transfer options to and from the camp. Please make contact on operations@ecotraining.co.za, should you require further assistance. What steps should I take to prevent contracting malaria? As none of us are health facilitators, it is best for you to contact your GP or travel doctor to glean their opinion on the matter. As all our camps are situated in malaria areas, we suggest you impart that knowledge to your doctor when asking for advice. Is there WiFi connectivity at the camps?